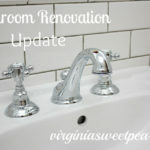 If you missed part one or two, we are in the process of remodeling our upstairs bathroom. Mr. SP worked very hard on Saturday and was able to get half of the bathroom walls tiled. We both are very pleased with the subway tile that we selected. Mr. SP likes a small grout line and placed the tiles close together. The grout that we will use will be grey. 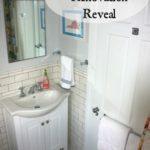 Cuts around the faucets and windows were tedious but no match for Mr. SP’s skills. He got a good workout, too, as each cut required a walk up and down two flights of stairs to the basement and back. 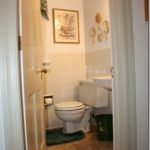 The old soap dish in the shower area was set in the wall and our new one will be in another position and tiled to the wall. Mr. SP had to cut a piece of backer board to fit the space and then fill it in with thinset. I ordered this fabric for the shower curtain and window treatment. I still need to find coordinating fabric for the window treatment and ordered a few samples. I hope one of these will work. 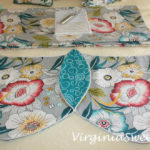 It will be much easier to pick a coordinating fabric when the main fabric arrives. Thanks for joining me for our update. Progress is slow when weekends are the only days available to work, but progress is progress! Paula, I LOVE the way the subway has come out and the trim tile on the top is just so classic. 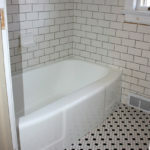 Mr. SP has done a fabulous job and and I’m with him I like tight grout lines too. Thanks for sharing. Wow, lookin’ good! I would think that the gray grout would be less stressful than the white. Love your fabric swatches! Looks great!! And I love your fabric. 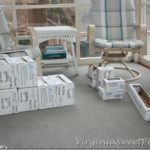 Can’t wait to see the window treatments all done, I love the colors you are choosing! 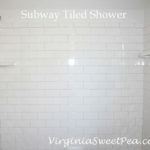 I ADORE subway tile! It looks fantasic! It must be nice to have such a handy Hubby! Consider me jealous. Love all the fabric you picked!!! I can’t wait to see it all finished!